The Platinum Tool Group provides complete Mold Repairs services at both its Windsor Ontario and Arizpe, Coah., Mexico facilities. Both facilities in Canada and Mexico are fully equipment to provide mold repairs, maintenance, and modifications to various industrial sectors in a timely and cost effective manner. Utilizing the vast experience of a highly trained workforce, we are able to provide routine maintenance, warranty work, tool refurbishment, welding, and polishing as well as more extensive reworks from badly damaged or crashed tools. Problematic Tooling – Put that problematic tool on a full-time scheduled maintenance program that Platinum Tool de Mexico is pleased to offer. Our services are available 24/7. If you’re down, we are up working diligently repairing, maintaining or changing your tooling to assure your problems are dealt with as expeditiously as possible. Design Services – Our Canadian facility, Platinum Tool Technologies provides around the clock design service support to our Ramos Arizpe facility. Begin with a bad design and the problems will chase you through the tools life cycle. As a solution, we can re-design and insert those problematic areas allowing for quick turn around repairs and changeovers using spares. Full Program Management – A program manager is assigned to your tool when your order is received to assist and guide you through your tooling requirements. Welding – Our experienced welders can repair injection molds made from a wide range of steel and aluminum alloys. 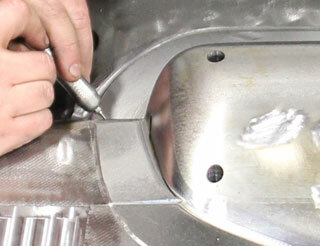 Polishing – Capable of producing SPI # 1 diamond finishes for those requiring a Class “A” surface finish. Need a quote for mold repairs and/or maintenance? Contact us and we will respond promptly.